The new Nokian Hakkapeliitta LT3 winter tire offers exceptional winter grip and driving stability combined with strong structure and superb durability. Designed for demanding winter use, the Nokian Hakkapeliitta LT3 is reliable and safe on icy roads and snow-covered worksites alike. To maximize the durability of this special winter tire, Nokian Tyres is introducing the world’s first stainless steel stud innovation tailored for heavy-duty use. The new Nokian Hakkapeliitta LT3 completes the modernized Nokian Hakkapeliitta winter tire family. The versatile Nokian Hakkapeliitta family includes novelties for passenger cars, SUVs and vans alike. NASHVILLE, Tenn. – Nokian Tyres, a global leader in safety and sustainability, is launching a premium light truck tire crafted to deliver peace of mind for winter work and journeys. The new Nokian Hakkapeliitta LT3 is designed for demanding winter use, offering state-of-the-art safety, driving stability and durability for professional use and daily driving. 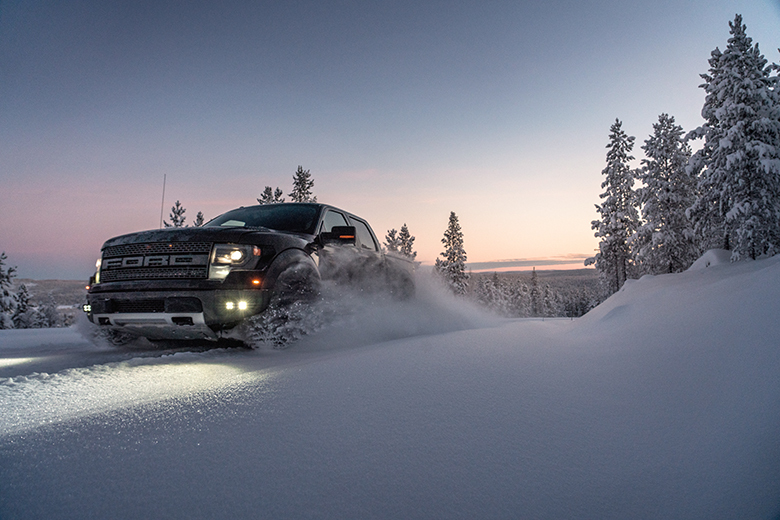 In addition to its excellent winter properties and strong construction, the Nokian Hakkapeliitta LT3 stands out from its predecessors thanks to the unique stud innovations and increased tread depth. Nokian Tyres, which invented the winter tire and holds over hundred winter safety patents, completely redesigned the studs on the Nokian Hakkapeliitta LT3 to tailor it for heavy use and harsh winter conditions. The comprehensive and modern size selection of the Nokian Hakkapeliitta LT3 covers 16 products from 16 to 20 inches with a speed rating Q (160km/h) and will become available to North American consumers in fall 2019. North America is a key market for the new tire, which the company will also release in the Nordic countries, Central Europe and Russia. The tire will be available with both factory studding and as a non-studded variant. The non-studded Nokian Hakkapeliitta LT3 is developed and tested to offer optimal winter safety in areas where studs are not permitted. Nokian Tyres’ renowned Hakkapeliitta winter tires are designed to tackle even the most extreme winter conditions safely and reliably. They answer the greatest winter driving challenges: braking performance, handling and changing lanes on roads packed with snow and ice. Those challenges are even tougher on vehicles that are carrying heavy loads. The Nokian Hakkapeliitta LT3 is made for heavy 4X4’s and pickup trucks and is the perfect companion for plowing roads or towing a trailer during the cold winter months. The most important feature of the new Nokian Hakkapeliitta LT3 is its new stud technology, which offers unprecedented grip in slippery conditions and resists corrosion from salty roads. The Nokian Tyres’ new Arctic stud concept consists of an entirely new stud model and body material built to enhance durability amidst heavy use and winter conditions. The stylish stainless steel studs are corrosion resistant, so the tire is able to withstand salted road conditions longer. The new Nokian Hakkapeliitta LT3 comes with increased tread depth of 16.5/32nds, and models with a higher load index (>121) have a tread depth of 17.5/32nds. Thanks to added tread and increased stud retention, the tire offers more durability and better mileage. Powerful and heavy vehicles demand a lot from tires. Tires must be strong and firm in order to keep the tall, heavy vehicle stable in challenging conditions. The Nokian Hakkapeliitta LT3 comes with a strong LT body structure, which actively manages high wheel loads precisely and safely. The strong body structure is also used to optimize the durability required by varying road conditions. The strong durability is complemented by an extremely tear- and cut-resistant tread compound. Developed specifically for heavy-duty use, the Arctic Grip compound offers excellent mileage, cut resistance and durability. Compared to the previous model, Nokian Hakkapeliitta LT2, the new Nokian Hakkapeliitta LT3 has been substantially improved in ice and snow handling and grip. The Nokian Hakkapeliitta LT3 also features improved grip on wet and slushy conditions. The tire also features a new, aggressive tread pattern that confidently removes snow and slush between the tire and the road. The design of the tread center improves stability and steering response, while tailored siping offers excellent traction and cornering grip. The new arrow-shaped pattern features deeper grooves for added slushplaning resistance and self-cleaning capability when driving in deep snow. As with all its SUV and light truck products, Nokian Tyres incorporated its revolutionary Aramid Sidewall technology into the Nokian Hakkapeliitta LT3. Strong, synthetic Aramid fibers make the tire resistant to impacts and cuts that could otherwise easily break it. Accidental tire damage can incur a high cost, but Aramid sidewalls that protect the tire from lateral impacts aim to prevent the damage altogether. Combined with a snowflake symbol, the indicator displays the percentage of tread depth that remains. The snowflake symbol remains visible to a groove depth of four millimeters. Once the snowflake has worn out, Nokian Tyres recommends purchasing new winter tires in order to ensure sufficient safety. Location and pressure indicators on the information area also provide peace of mind. The information area allows tire dealers to record the correct inflation pressure and installation location when changing the tires. Arctic stud concept: No corrosion, more safe miles. The new stud model and material improve durability in heavy use and winter conditions. The stainless steel studs are corrosion resistant, so the tire is able to withstand salted road conditions while keeping the appearance stylish. Aggressive tread pattern with deep grooves: Effective removal of snow and slush. The design of the tread center improves stability and steering response, while tailored siping offers excellent traction and cornering grip. Deeper grooves add slushplaning resistance and self-cleaning capability. Sipe activators for strong snow and ice grip: Sipe activators located on the tread shoulders ensure driving safety under rapidly changing weather conditions. The wider sipe activates the narrower sipe. This functionality adds grip for extreme situations in the most slippery road. Brake Boosters for better braking grip: Brake boosters on the tread block shoulders improve braking grip on snow. The serrated pattern of the brake boosters improves snow grip. Arctic Grip Compound. Excellent mileage and cut resistance: The extremely tear and cut resistant tread compound is developed specifically for heavy-duty use. Aramid Sidewall technology. Extreme durability: Extremely strong aramid fibers reinforce the tire’s sidewalls to provide more durability and protection for demanding driving situations. The fiber makes the tire more resistant to impacts and cuts that could otherwise easily damage it.